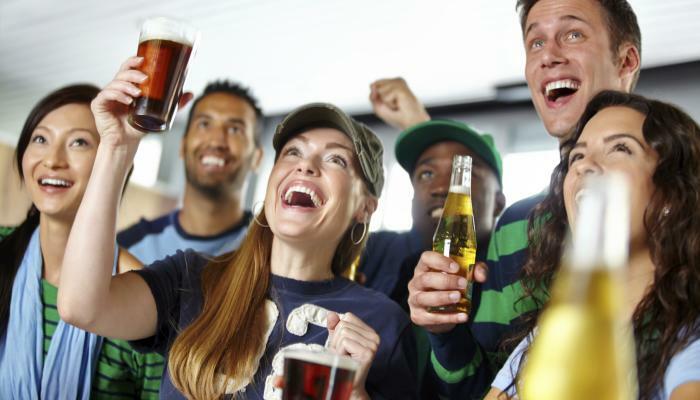 The Big Game is almost here, which means it’s time to get your play book together if you’re planning on hosting or attending a party, or if you’re headed to an Arlington sports bar to gather with friends and soak up all the action. Make Your Own Irish Nachos, or Order from J. Gilligan’s! If you’re not down to cook, or just can’t, J. Gilligan’s will have the game on every television, are more than happy to lay down their famous Irish Nachos for you and your crew to munch on while you passionately yell at the big screen. Fix a DIY Football-Themed Veggie Tray, or Pick One Up at Whole Foods! Look how cute this veggie tray is! We are a fan of the little football-bread pieces and the assortment of HEALTHY goodness. Take a minute to chop your own veggies, make your party tray completely custom and beautiful, or opt for an already prepared tray of organic veggies at Whole Foods. Our tip? Call ahead to make sure they will have your dream tray ready for pickup. This is your time to show your friends that your mixology skills are top notch. Give them something to rave about with the recipe above OR prepare your alcohol in advance by ordering up a gallon or two from Daquiri Depot. Daquiri Depot has already made frozen margaritas, White Russians, pina coladas, hurricanes and more at your beckoned call. We know Legal Draft is sold in stores around the state, so check out your neighborhood grocer and pick up a favorite like the Accused Amber Lager or Chief Justice Stout, because you’re fancy like that. Or, get the biggest growler you’ve got and head over to Division Brewing, where their eclectic mix of beers will add a new favorite to your beer repertoire, and start that conversation you’ve always wanted to have with your neighbor who always wears “Beer Knurd” shirts. You’re welcome. Needing a keg? Visit On Tap, where you can get a full keg of Arlington favorites for your and your buddies to have an endless flow of great beer for your party. Bringing something to a party? Add a present for the host who’s done the most! Parties are stressful, be a great guest and pick up a little token of your appreciation for the chef/host or hostess/party planner at Gene Allen’s, Arlington biggest gift store. From their signature Texas-shaped homemade fudge, to cute jewelry, doo-dads and more, Gene Allen’s has gifts for the men and women who keep the party going. Buffalo Wings & Rings: What’s more football thank chicken wings? Arlington’s Buffalo Wings & Rings will be hosting a Super Bowl Watch Party, featuring all-you-can-eat wings for $17.99 per person, $4 shots, $3 pints and $3 famous Buffalo Bill Daquiris. With 34 big screen TVs scattered throughout, it’ll be hard to miss a play. Plus, they will have multiple drawings during the game for hats, shirts, back packs, gift cards, a 50” TV (fourth quarter) and more! BoomerJacks: You might score a 50” HDTV when you enter to win at BoomerJacks. Not only do they have a ton of TVs, but they will have great drink specials and 69 cent bone-in wings. Call 817-275-5400 for more info or visit BoomerJacks.com. Alley Cats: Catch the BIG game on BIG screens! Alley Cats will be showing the game on their HUGE screens, keep you quenched with drink specials (including $4 wells & $15 domestic buckets), $12 single topping pizzas and 65-cent bone-in wings. Call 817-784-2695 for more info and details.